The enigmatic frontman Jeffrey Nothing has teamed up with fellow former MUSHROOMHEAD guitarist Thomas Church and former MOTOGRATER, THE BROWNING drummer Noah "Shark" Robertson as well as vocalist Ian D Sniesak and bassist Kahler Jakee Hatrix from the band SKIN! 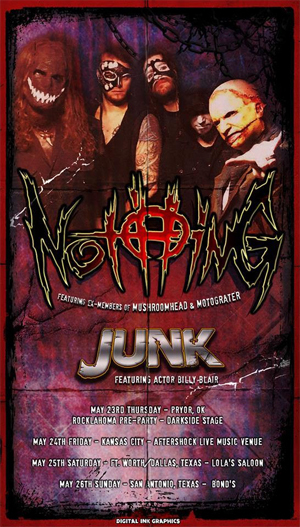 The group will hit the road in May 2019 with support from JUNK, featuring actor Billy Blair who has appeared in films such as Rob Zombie’s upcoming horror flick 3 From Hell, as well as Alita: Battle Angel, Machete, Machete Kills, The Last Stand, Jonah Hex, and Sin City: A Dame To Kill For, among many more. Two NEW singles/videos from Jeffrey Nothing, "Dead Space/Dead Inside" and "Fragile Mind", are out now; available for download and across all streaming platforms. Nothing's distinct vocals had driven MUSHROOMHEAD's frightening and extreme performance style, garnered them an enormously devoted cult following and allowed them to sell more than one million albums worldwide. Nothing released his debut solo album, The New Psychodalia, in 2011 which included the single "Sin O' Cism". In 2013, Jeff starred in the movie 13th Sign. Jeff Hatrix was also the singer of Cleveland-based thrash metal band HATRIX, as well as fronting the group PURGATORY in the mid-'80s. The newest single from JUNK entitled, "Pop Rock Genocide", is featured in the horror/comedy movie Cherokee Creek, and is out now via Zombie Shark Records. The band also features singer/songwriter Benjamin K Bachman on vocals, Phil Sahs on bass guitar, David Dunlevy on guitar, keyboards, and backing vocals, and a special guest drummer. JUNK recently opened for STEEL PANTHER and made a double appearance during this years SXSW Festival in Austin, TX.